Alright, it’s time to put UFC 168 in your rear-view mirror. The Octagon comes storming back this weekend with its first event on UFC Fight Pass. UFC Fight Pass is currently free, but it will cost you $9.99/month starting March 1. Need some extra cash to pay for the Ultimate Fighting Championship’s new online network? Despite competing int he show’s co-featured attraction, the biggest name in Saturday’s event in Singapore is Tatsuya Kawajiri (pictured). 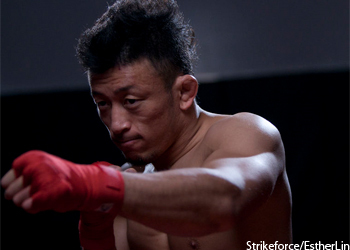 The veteran is a -170 odds-on favorite to beat Sean Soriano in his UFC debut. Soriano is a +140 underdog. Don’t forget the fights start bright and early tomorrow morning at 6:30AM ET/3:30AM PT. So, make sure to get your bets in on time. Bayfront Avenue, Singapore hosts the festivities.